It’s not about the square itself, but about the people that brings live to it. Yesterday’s workshop was a great sight for the eye and the heart. Elger Blitz (CARVE, NL), an architect specializing in designing playgrounds came all the way for Amsterdam to share his ideas about PLAYING. Participants had all different backgrounds and ages. Elger showed us a footage he had put together for that occasion. “It is hard to know how things are from afar, so I decided to show you something that is not related”. The presentation started with Huizinga Johan a Dutch historian from the 19th century talking about “Homo Ludens”, the playing man. Then, a short film about the international situationists, a progressive group of political artists influencing today urban planning, re-thinking the city from routine and work to a playground, and idea still very present in the minds of urban planners – the city as a playground. 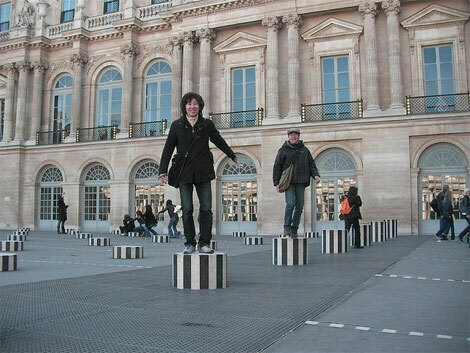 Later, we watched “Les deux plateaux” an art piece by Daniel Buren showing how art in public space can also a become place to play and interact with. Elger also showed projects from his hometown Amsterdam – museumplein , a space that even though has no particular function, is being used by the citizens as a play area because it is well situated. A skateboard arena – as an example for an assigned space, then a branded space – i amsterdam which works as a city branding but also a tactile place where people are playing with the letters and taking pictures of themselves. These examples made us re-think about what is playing? do we always need to have a specific infrastructure to play? What kind of encounters can games and playing create between people? Then, it was time for action! Elger invited the participants to divide into five groups of three participants each, and to think about the question “what would YOU like to do on the square?” The question made an important emphasis on the the personal view of the participants, rather than asking what should be done in the square. 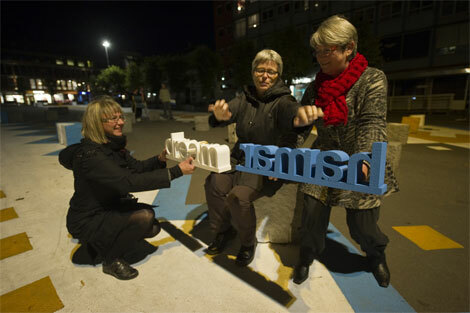 The task was to use two words made of polystyrene: dream + hamar and take pictures expressing the actions you would like to do on the square. 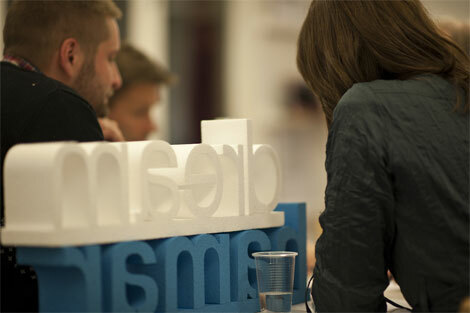 The results were very creative and diverse, and the participants laughed while experimenting with the letters, trying to figure out how to expres their thoughts using only a few tools. 1. The square is a place to exchange ideas and knowledge education and learning.“Can the square host a place where one can fix his car/bike?” Gudbrand Kjøs “The square should be a place where everyone can feel free to come and use it, also the subcultures, like the youngsters using their cars”. “Remember the Amsterdam logo we saw in the movie, maybe we can consider the dreamhamar logo also as city branding, but not in commercial tourist way but in a social communal way so that all the participants will be part of it”.